ETF Index Tracker Proposed Strategy: A Risk-Free Investment? Using covered call writing and exchange-traded funds (ETFs) is a viable approach to generating monthly cash flow. I personally use this strategy in my mother’s portfolio. Can this investment style be expanded to include inverse ETFs to move this expanded path to a near risk-free system? In April 2017, Rushbabh, a member from Australia, was kind enough to share an idea he developed involving ETF and inverse ETF index trackers combined with covered call writing. The question Rushbabh posed to me asked if I thought this could be a risk-free investment. The scope of risk: no free lunches! If our goal is to exceed risk-free returns (Treasuries for example), we must incur some risk. As investors, we must locate and define our comfort level as to how much risk we are willing to expose ourselves to and determine the return goals we are seeking. If Treasuries are at one end of the spectrum and buying lottery tickets is at the other end, then covered call writing is somewhere in between the two and closer to Treasuries in my view. Of course, this assumes mastering the three required skills (stock selection, option selection and position management). 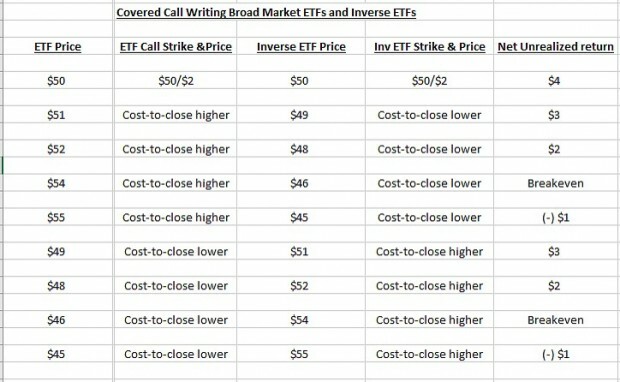 The takeaway from this (admittedly) non-scientific study is a guideline we have applied to covered call writing for years…once underlying (combined in this case) share price moves below the breakeven, we start to incur loses. Until a longer-term analysis can be examined, it initially appears that this is a strategy that will have positive results when there is little price movement in the underlying securities. The term “risk-free” is not appropriate. In our stock market environment, there are no risk-free trades. There is certainly nothing wrong with looking to develop new strategies that will minimize risk and I commend Rushabh for thinking outside the box. I admire members who seek to achieve even higher returns using their education and trading skills. Money Expo: An online webinar event: Monday October 9, 20173 PM ET: Online event hosted by The Money Show. 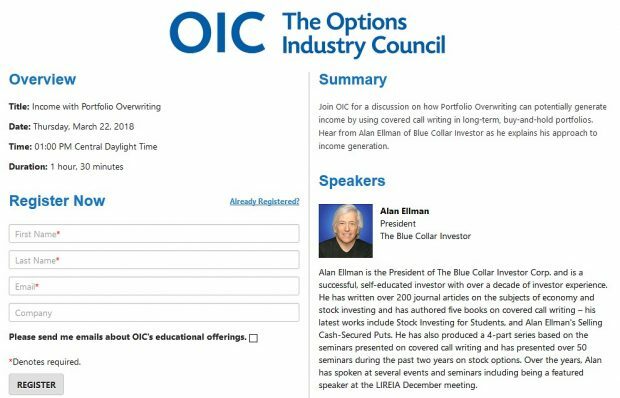 Alan will be a featured speaker at MoneyExpo, which is the biggest online-only premier event for traders and investors across all traditional asset classes. Registration link and information to follow. The 6-month charts point to a cautiously bullish outlook. In the past six months, the S&P 500 was up 3% while the VIX (10.13) moved down by 20%. Our thoughts and prayers are with all our friends who have been impacted by Hurricane Harvey. I use Schwab for my trading. They made a commission change a couple of weeks ago. For all options with ask price of .05 or lower, there is no commission. You still pay the per option charge of around $.50/ contract. Looks like this may help near expiration day, roll out or even close a position at a small fee, rather than wait over the weekend for expiration. Is this correct: Intrinsic value is the amount above the struck price as a gain if you had never put a covered call option in place? Do you look at this value when and if you buy back the option. How is intrinsic value used? When we enter a covered call trade with an in-the-money strike (below current market value of the stock), the intrinsic value represents protection of the time value initial profit. For example, if we sold the $30 call on a stock trading at $32 for $3, $2 is intrinsic value and $1 is time value. We are obligated to sell the stock at $30. Our initial time value profit of 3.3% is guaranteed as long as share value does not decline by more than 6.25% ($2/$32). If an out-of-the-money strike moves in-the-money due to share value appreciation, the intrinsic value cost-to-close is compensated by share appreciation. In the above example, if share price moved to $33 and the cost-to-close is $3.20, the intrinsic value of $3 is compensated by share value moving from $30 (our original obligation to sell) to $33 (current market value). In this scenario, the time value cost-to-close would be $0.20. Use the “What Now” tab of the Ellman Calculator to calculate these type of results. The problem with paper trading is the removal of emotional involvement. Emotion is the most potent ingredient in making a trading decision. So, if one wishes to test a different strategy or tactic, I believe it is better to start with small, controlled cash outlays, to feel the “real thing”, and increase the ammounts gradually if successful, and as confidence in the method grows. You can’t learn to swim without getting wet. You are definitely correct that human nature is such that a more realistic return is garnered by investing real money. However, I do feel that, for beginners, starting with paper-trading does have value and then can move to investing with small amounts of money in actual cash accounts before becoming fully invested. My concern is for beginners losing money before becoming completely familiar with all the nuances of the strategy. I agree, you have convinced me. I would offer that the progression with a new strategy would be to back test it first, then paper trade it and then, as you suggested, start with a small, controlled cash outlay to feel the “real thing” and increase the amount gradually if successful, and as confidence in the method grows. Paper trading offers several benefits if done on a legitimate platform that replicates actual market conditions (buying at the ask, selling at the bid, with trade execution only if actual trades occur IRL at those prices). that is really a complete an detailed explanation for my somewhat hasty words, and gut feeling, on paper trading. I am sure it will help many people who read us here, including myself. This week’s Weekly Stock Screen And Watch List has been uploaded to The Blue Collar Investor premium member site and is available for download in the “Reports” section. Look for the report dated 09/01/17. Just totaled up my returns for August. My portfolio gained 1.5% after fees. I held 40% cash, which brought down my returns, but in this market I just can’t bring myself to be fully invested. That 1.5% is great while holding 40% in cash. It implies you did more than 3% average per trade. The important thing, I also have found, is the YTD Percent and Annualized figures. Despite the market performance last month where i gained only 0.5%, my YTD annualized is 21.8% so far (see attached image or performance table). Interesting, that since you mentioned you kept 40% in cash and that is your normal cash position that one can calculate 2 YTD figures, one an Invested YTD and the other an Overall YTD (including the cash). I find myself now being happier placing ITM trades with a few OTM trades so I am more likely to get a positive outcome at the end of the year. I look for less volatile chart patterns and support levels near or greater than my Breakeven points instead of looking for large downside protection. If the stock price is near the ITM strike, better for me, since the Time Value is larger. Have to increase my chances. 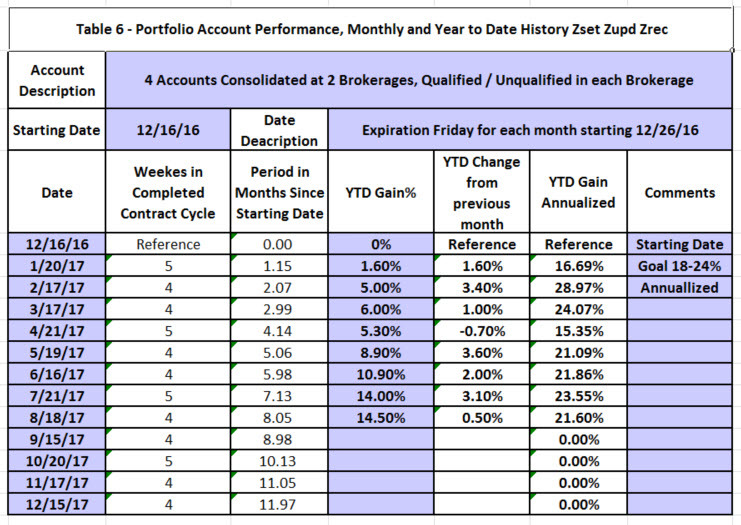 I updated the attached performance table to automatically calculate the cycle period, months to date, and annualized Performance from the manually entered YTD Gain, which I calculate elsewhere for the portfolio. “That 1.5% is great while holding 40% in cash. It implies you did more than 3% average per trade.” – I assumed he was saying he made 1.5% on the stocks he was holding, though obviously Allan could clear that up. A 3% average would be truly remarkable given the RUT lost about 6.2% last month, depending on how much was invested (I’m finding it more difficult to diversify enough each month as I add more capital). 22% is an excellent annual return Mario, even better if you can compound it. How many stocks are you looking at before opening your positions each month? It was 1.5% on my total CC portfolio (cash and securities). I received dividends in August and hit a ‘double’ which contributed to the final tally. That’s even better news.. hitting a double. What was the Symbol? The profit potential for a short $50 straddle is the premium received ($4) and the break evens are $46 and $54. Outside of those prices, losses occur. The good news is that Rushabh was thinking outside the box and trying to analyze a complex position. ” What If ” is an essential part of understanding options and applying them correctly. The bad news is there are no free lunches. Market makers and floor traders do risk free trades like conversions, reversals, etc. but frictional trading costs as well as lack of of size almost eliminates them for retail traders. Rushabh’s position isn’t one of them. There is a large number of bold entries that passed all screens in this weeks report. Is it unusual to have this number of stocks as candidates? Over the years we have found that the number of stocks on our weekly watch list is a good indicator as to the health of the overall market. Chart technicals play a major role in the number of “bold” stocks. In the past week, the market was up 1.4%, a robust amount. When this occurs, it is not unusual to have a large number of eligible candidates. Welcome to the wild ride we call September :)! So many dominoes stacked against the market between N. Korea, debt ceiling, budget deadline, Harvey aid and the statistical history of the month itself all good contrarians know it can only go up :)! I’ll confess I had YTD gains to protect so I took IRA profits Friday and built a lot of cash leery of September. Core holdings are all over written. I plan to now sell cash secured puts further below market on down days to force the discipline of buying back below where I sold. But for those 100% long with overhead calls written have no fear: I am a fantastic contrary indicator! When I am antsy it is usually a good time to buy or just be long. It’s times like this where ‘option management’ becomes so important. Who knows, maybe even smack a double or two! that’s a win win situation you have with your “other’s” account. If you are right you win, and if she is right you will both be happy that she wins. Way to go my friend, keep it up. While the market was down over 200 points today, I was able to use Watch Lists I created of the BCI Premium Run List to quickly identify several stocks that I could buy Covered Calls with $18K of cash I had still in cash. I finally selected NCLH, which was about 4% down and had a nice low risk chart and Gain numbers. Found the time to become more familiar with Finvix.com.com web site.general features and particularly the Watch Lists. I like the Watch List you can create. Simple yet powerful and easy to create. I take the Premium Report Run list and enter it into a Finviz Watch List. * I created the watch list before the 9 am Monday opening. This allows me to automatically enter the Fridays Closing Price which is also in the Run List. For each symbol you enter, Finviz has a button to GET TODAYS PRICE, which over the weekend is the closing price. This saves a lot of data entry time. * Now that I have the watch list completed, I can sort by any column in the Watch list to pick stocks I may want to trade. * One useful feature is that you can hover your mouse over a stock symbol and see the latest chart movements to identify potential picks. * You can also Right-Click, Select New Tab on any symbol and get a detailed report on the stock, while keeping your portfolio in another Browser Tab. There is a link to the company’s web site in the Symbol page. Quite useful. .
* I do know what the watch list limit is per guest customer. But I found out today there is a 100 line item limit per watch list. * You can register for free to be able to create watch lists and get a lot of information. * When you open a watch list, news for all the stock in your watch list appears below the list. * The only other feature in Finviz that I have slightly used is the Screener Menu option. I found it has a lot of features and power. Hope the above has been helpful. Nice discussion. I use FinViz ALL the time…it is my go-to news site. You also might want to take a look at the CNBC site. They also have a nice portfolio management tool that gives you prices in real time. they also give you pre-market pricing on the major indices…i check those every night. Checking finviz in the AM is part of my morning “ritual” I check for any key geo-political developments as well as the news on the stocks that I hold in my portfolio. Thanks for the comments on Finviz and CNBC. I already checked out CNBC. Like it. subscribed to some of the newletters. Setup a watch list. Lots of features and information presented in a concise format. As always I appreciate your tireless devotion to our community sharing your trades so we all may learn. You are right, Jay. Just did not do that. Since we are entering Week 3 probably in my mind wanted to keep it simple and minimize my future workload and get the 18K invested. I do have a Hurricane Irma and other chores to do. The STO did add 0.6% or $107 total to the income. Would have been less if I waited because of time decay. Otherwise the rest is all upside potential. Let’s re-visit this after Expiration Friday and then I can compare the Before and After. If the market stays up at Expiration Friday I will have many roll outs to do. The last two Exp. Fridays were relatively easy since Market dips on those Friday made many options worthless. I am in New Orleans and have a wary eye, as you do, on Irma. We both know all about hurricanes. You manage more positions than me. It makes perfect sense to keep them on a common date. I see your point, If a stock has Weeklies, you can then sell an option for 4 weeks any time, benefiting from a full cycle. To keep things simpler for me, I can use buy/wait selectively for the first 2 weeks of a 4 week cycle and still maintain my common Expiration Friday date. That will probably work best for me and is a good compromise. To maintain multiple Expiration Fridays will be too much both in time and documentation. Through hard work you enjoy the good fortune of managing a large portfolio. I very much get the efficiency of a common date. I trade/invest only in ETF’s and larger cap stocks that all have weeklies so I can craft “months” of my choosing. Buy/wait works for me (Alan will have to give me credit for that term if he discusses it in upcoming books!) and I do not find it cumbersome to have a variety of expiration dates since I rarely have more than a dozen positions and this is my main hobby. I evacuated New Orleans for Katrina and two other hurricanes since. I gather from context you, and now Alan, are in South Florida. You don’t need me to tell you to favor caution over bravado. Leave if there is the slightest question in your mind before it becomes impossible to do so. Have you ever missed an Expiration Friday strategy because of an oversight or maybe error in noting down your Expiration Friday date? What system do you use to prevent that? When I consolidate my 4 accounts into one in a Fidelity watch list, I sometimes add an option symbol for a weekly accidentally instead of the third Friday. I catch the error later when I notice the time value of the option trade is out of kelter from other trades. In making my CC buy and sells, I have to double check my orders so I do not make an error. With Fidelity, to set up a CC, you right click strike, select Buy Strategy and you initial order screen is set up for 1 contract.. If you increment the contracts, it automatically increments the Share bought or sold in 100’s. If you increment the Shares bought, it increments in 100’s and also increments the contracts as well. No chance for Error. If there is an order entry mistake to be made I have made it :). I have done every dumb thing that is possible to do and scrambled after the fact to undo it since I am a computer klutz! I am also an Options House customer and I am not happy with the buy out by eTrade. They grandfathered my low commissions but the platform is not as good and I find it frustrating. I have not had a problem with missing expiry’s or confusing them since I don’t have a big number of positions and I look at them each day. Thanks for being so forthright….It’s embarrasing to myself when you repeat it again a second time. That is what I am trying to avoid. You are right. Not a time to do things with haste. I look at the trade a few times to make sure something obvious is not right for the trade. Like having 3 contracts and 200 shares (Probably will be rejected) or having 300 shares and 2 contracts! I have a question about option liquidity. I use Tastyworks which rates the liquidity of the option on a scale of 1 to 4 (best). Many of the stocks highlighted in the weekly report are rated 1 or 2 which I have been passing on. Do you have any concerns with the liquidity of the stocks that are on the weekly list or am I just missing out on some really good trades? In the BCI methodology, both stock and option liquidity are important. We require a minimum average trading volume of 250,00 shares-per-day or more on the stock trades and an open interest of 100 contracts or more and/ or a bid-ask spread of $0.30 or less for option trades. In our premium reports check the column titled “NTM OI > 100 contr” If you see a “Y” this means that a near-the-money strike does meet this criteria. These guidelines are geared specifically to our 1-month option obligations. We should also be prepared to leverage the “Show or Fill Rule” and negotiate the best possible option prices whether selling or buying back. and price. Strike 80 changed to Strike 79.57. 80 – 79.57- $0.43. Do you know why it is not $0.45. Great question that me scratching my head as well regarding the discrepancy in dividend and strike. Then I realized that EDU was an American Depository Receipt (ADR), a foreign company trading on US exchanges. The stock certificates are held by a bank that charges a deposit fee in cases of special dividend distributions. In this case, it appears that fee is $0.02 per share making the net of the dividend distribution $0.43, not $0.45. Plain vanilla, anticipated, recurring dividends don’t change strikes because market-makers know they’re coming and the option pricing factors the ex-date into the value of the options…calls decrease in value and puts increase in value because stock price will go down on the day of the ex-date by the amount of the impending dividend. Our Florida office will close as of Saturday and will re-open as soon as it is safe to do so. All reports and blog articles will be published at its normal time and will not be impacted. All book and DVD orders will be shipped from our New Jersey office within 1-day of the order. Email and blog responses may be delayed. I am a novice in covered call trading.Just started going through your videos and ordering your book. I have a question regarding when to place a covered call ,in the monthly covered call selection I could see October 20th calls,today is September 6 th ,what is the best time to sell a covered call. I have 101 South west airlines stocks purchased at 61$ ,and now trading at approx 51$.Do you think I should consider ITM covered call or should I sell put ? 1- My personal preference is to use Monthly options that expire on the 3rd Friday of the month. Some of our members prefer Weeklys that expire every Friday. 2- The best time to enter these positions is within the first few days of a contract (the Monday or Tuesday after expiration). 3- Southwest: First we must determine if this is a stock we want to keep in our portfolio or are we willing to sell. If keep, stay with out-of-the-money strikes. If not, in-the-money strikes will work (101 shares will allow the sale of 1 contract). 4- In general, airline stocks are not the best securities for option-selling because they provide monthly capacity reports that act like earnings reports and create risk. If you plan to hold LUV for the long haul, writing calls is okay. 5- Selling puts is generally reserved when we don’t yet own the shares. They give the right to the option buyer to sell their shares to us. If we sell a put our position in that stock can increase and will have no impact on the shares we already own. Buying a put, on the other hand, will offer downside protection on this declining stock. A. It doesn’t matter what we paid for a stock in the past. Our current decisions are based on current price. B. Take your time…we shouldn’t start selling options until we have mastered the 3 required skills (stock selection, option selection and position management). Once we have achieved this level of education we now will have years and decades to benefit. I have a question about ITM covered calls,are ITM options exercised all the time? If yes,when will these options will be exercised ? Is it before the expiration cycle or at the the time of expiration? Technically, our ITM options are “American Style Options” which can be exercised by the option holders AT ANY TIME until 4 PM ET on expiration Friday. Practically, however, options are rarely exercised early because the option buyers are better off selling the option rather than exercising it and selling the stock. When options are exercised early, it is usually related to an ex-dividend date. Selling the option results in capture of intrinsic value + time value Exercise and selling the stock results in capture of intrinsic value only. Expect all options that are in-the-money by $0.01 or more to be exercised the Saturday after expiration Friday. Keep in mind that we can avoid exercise by buying back the ITM option prior to 4 PM ET on expiration Friday. ITM calls are more likely to be exercised early if they have very little time premium left in them. ← Naked Options versus Covered Options: Where Should We Take a Stand?